Over two thirds of vehicles are fitted with air-conditioning and climate control systems as standard these days. Many of us are familiar with using air-con in our car on both hot and cold days, however not many people are aware that like other parts of your car, the air-conditioning system also need regular attention and maintenance to ensure that it continue to work efficiently and effectively. You many not be aware that over 10% of air-con gas permeates from the air-con system every year, which means that it may not work as well as it should. This is why car manufacturers recommend that your Air-Con System is recharged with gas and lubricant every 2-years. This service is not part of routine vehicle servicing, there for if your vehicle is more than 2-years old, it is probably due a ‘recharge’. 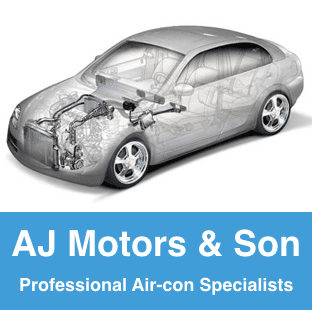 AJ Motors & Son now offer a complete air-conditioning recharge service at a value price of £65.00 + VAT. Come and see our Aircon Specialists and check to see if your require your Air-Con recharged?